A coronary cameral fistula (CCF) involves a sizable communication between a coronary artery and a chamber of the heart. A 13-day-old male baby presented with feeding and breathing difficulty. The physical examination showed heart rate was 140/min and regular. Femoral artery pulsations were feeble. Respiratory distress and tachypnea were noted. Chest X-ray showed mild cardiomegaly, with features of increased pulmonary blood flow. Electrocardiogram (ECG) showed biventricular hypertrophy with sinus rhythm and no features of ischemia. Transthoracic echocardiogram showed a discrete coarctation of aorta and patent ductus arteriosus with bidirectional shunt. 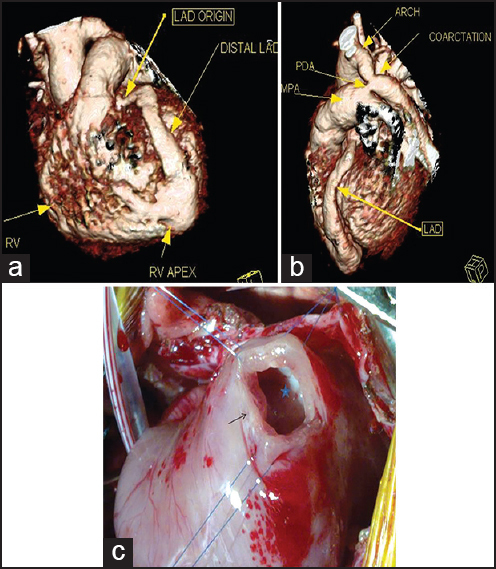 In addition, a large coronary artery to right ventricle (RV) fistula was seen at the apex with the left anterior descending (LAD) artery measuring 1 cm in diameter at its origin. Left ventricular ejection fraction was 50%. The findings were confirmed by computed tomography (CT) which showed a large aneurysmal LAD that formed a giant aneurysm just before its termination into the RV [Figure 1]a and b. The baby underwent coarctation repair through a lateral thoracotomy; resection of the coarctation segment with end-to-end anastomosis of the aorta was performed. The reason to approach the coarctation from the left side was because that it was felt from the CT images that apical fistula could be accessed and ligated without use of cardiopulmonary bypass. However, at inspection, after opening the pericardium from the side, this was not found to be possible and a midline approach was subsequently utilized. Through a median sternotomy, on cardiopulmonary bypass and cardioplegic arrest, the fistulous sac was opened at the RV apex. Both the openings of fistula into the RV and the terminal end of the LAD closed with separate autologous pericardial patches [Figure 1]c. The fistula was so large that a double patch was required to secure a watertight closure. Finally, the sac was closed to cover up the suture lines. Echocardiography at discharge, showed well opened aortic arch, normal flow in the coronaries, and no residual leak at the site of the CCF.